Have you ever had a recipe stick with you after reading about it? But I mean, like stick with you for years just waiting for you to make them? I’ve had that with these Ham and Cheese Sliders. I saw them on Emily’s blog way back in February of 2010. Sure, just 3 years ago. Her friend Jenna of Just Cook Already brought them to her baby shower for her first son. They looked so good that I have been thinking about them since then. Seriously, do you see why I’ve been thinking about them?!?! Well, since this weekend’s race is at Martinsville Speedway in Martinsville, VA I figured these would be perfect to make for my Sprint Cup Snacks for the race. When I think of Virginia I think of ham (and of lovers) so I figured these Ham and Cheese sliders were the perfect fit. The original recipe makes 24 sliders so these are perfect for a crowd but we halved the recipe and just had leftovers for lunch the next day. They were fantastic straight from the oven. Like burn the roof of your mouth hot since I wanted them so badly. The whole house smelled great during the cooking process form the ham, Swiss, and the mustardy poppy seed sauce. The sauce makes it. It just doesn’t. Don’t skimp. Maybe even add more. 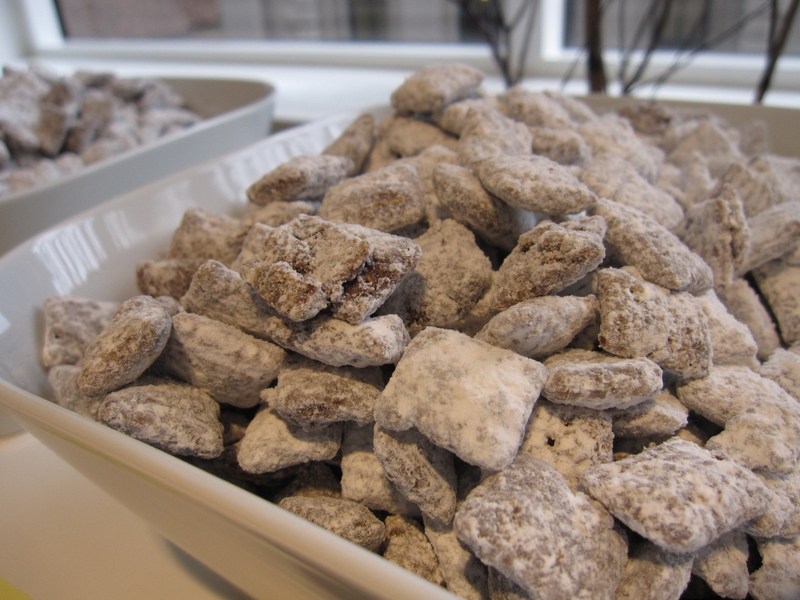 I swear to you from the bottom of my heart that if you make these for a party they will be a huge hit. They will be a huge hit at home if you make a small batch for dinner. And when you make them please be sure to invite me over! Kthanks! 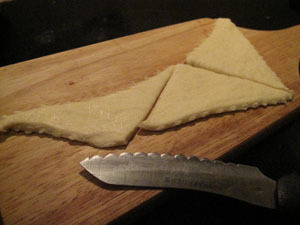 24 slices of Swiss cheese, if they are large slices then only use 12 slices. Halve the rolls to separate the top from the bottom. Put a bit of the mayo into the cut faces in the center of each roll. Place the bottoms of the rolls in 2 9″ x 13″ baking pans. 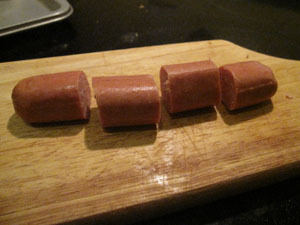 Place a fold piece of the ham and the Swiss cheese on each roll. Place the top of the rolls on the cheese to close the sandwich. In a medium bowl, whisk together all of the poppy seed sauce ingredients. Evenly pour the sauce all over the sandwiches. Let the sauce sit on the sandwiches for 10 minutes, or until butter sets slightly. Cover with foil and bake for 12-15 minutes or until cheese is melted. Uncover & cook for an additional 2 minutes. Serve warm. Martinsville Speedway is pretty special… it’s the shortest track on the NASCAR circuit and only racetrack that has been on the NASCAR circuit from its beginning in 1948. It was built in 1947 and has had a lot of interesting races here since there are 2 races at that track each year. Richard Petty was the youngest driver to win here at 22 years, 283 days old and he holds the title of most wins (15). 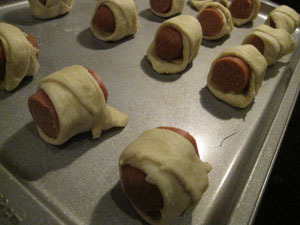 Pigs in a Blanket are a classic hor dourves. They commonly grace plates at parties because they are easy to make, can be dressed up, and are loved by all. I felt that with New Years quickly approaching! that I had to whip of a few to celebrate a bit early since we will be traveling for New Years. 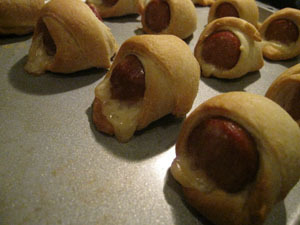 I, being a cheese lover, added cheese to my pigs in a blanket. 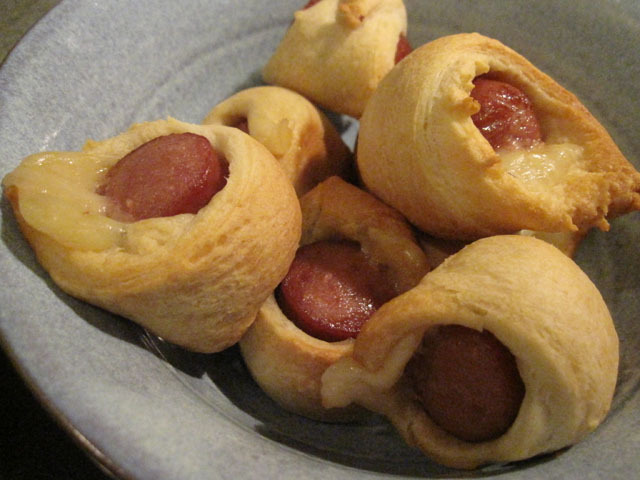 I used Swiss cheese because it has a great flavor to stand up to the buttery crescent roll. Using sliced cheese is better than using shredded cheese because it is easier to work with and evenly portion. Enjoy the Piggies with a dipping sauce. I prefer mustard because it goes so well with hot dogs. Since I used swiss cheese in the recipe, I suggest a Dijon mustard because it is fairly acidic and it holds up against the strong swiss. 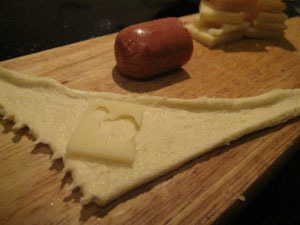 Cut each crescent piece into 3 triangles, cut each hot dog into 4 pieces, and each slice of cheese into 12 slices. This results in 24 pieces of each ingredient. 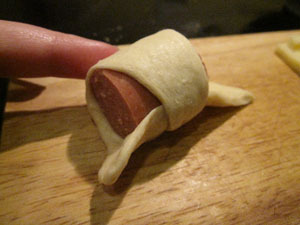 To assemble the pigs in a blanket, lay out a piece of crescent roll, then a piece of cheese, and then a piece of hot dog. Roll the crescent to seal. Arrange all pieces on baking sheets and bake for 15 minutes, or until golden brown.